Greetings. This is Reema Goode writing to you from inside the Islamic Arabian Peninsula. We are temporarily bringing my blog out of retirement in order to share an important announcement with you about the Region Wide Call taking place 10 days from now. What is the Region Wide Call? It is an invitation from believers all over the Arabian Peninsula, to you. We are followers of Christ from all nations and all languages. From sunset on June 11 until sunset June 12, we will gather in groups, in our own locations and languages across the AP, to cry out with one united voice for the Holy Spirit to fall on this land in a history-making way. Historically, it has been difficult if not impossible for believers in the Arabian Peninsula to gather together in unity for a large-scale prayer event. It is not denominational issues that separate us, but languages, physical distance, venue, security questions, and the like. The Region Wide Call has been set up to eliminate those obstacles. With these earthly limitations removed, far more of us will be able to actually participate in this prayer event than any other we have ever had. And we are inviting YOU to join with us wherever you are. Please visit the RWC website’s “About” section for details, and instructions on how to participate. Spread the word to other believers! All are invited to post about manifestations of the Glory of God in their areas after the event! May the LORD raise up many individuals to form groups in their own locations & language groups. And may all our testimonies result in a wealth of praise poured at His feet! Today is a bit of an auspicious day for me. This will be my last post. Five good years have passed since this “book blog” originated, in July 2010. It is with a twinge of sadness that I bid farewell, but I must confess that the overarching emotion in my heart is joy. Joy for what has been, and a joyful anticipation about what will be. I feel a bit like a kid on Christmas Eve. First, to inform the praying Church that God has indeed heard their prayers and is answering in wonderful, unexpected and amazing ways! Hearing specific answers to prayer is the best fuel for even more effectual, fervent prayer. Pray on! Second, that the LORD would thus be glorified, thanked, praised and magnified in His Church for the great and awesome things He is doing. May God grant us hearts to revere Him as who and what He really is: the One who is worshipped by angels and who dwells in unapproachable Light! Third, that through our testimony, joined with the testimonies of saints around the world, the fame of the LORD God and His wondrous works would spread, bringing Him glory and honor across borders and into all nations. Testimonies serve as a powerful faith-building agent. Through each other’s stories, we see deeper into the heart of God. I believe that is one reason God wrote the Bible in the way that He did. And as we observe His dealings with other people today, His character, nature and ways are illustrated again—perhaps even more personally, for His ways are being applied to life in our own current context. Fourth, that seekers and secret believers in the Muslim World would know that they are not alone, but are in fact part of an enormous movement. A movement that did not originate through the will of man, or the efforts of a religious institution, but in the heart of God. It is a movement which began singly with His will to seek and to save the lost, is sustained regardless of opposition from man or devil, and which will be completed only through His sovereign power. Take heart, my friends, our God is in control! Fifth, that the spiritual gift of exhortation would operate through the printed page to inspire and embolden believers in their own walk of faith, to follow Christ wherever and however He leads, no matter what anyone else is doing. That each member of the Body of Christ would be filled with the knowledge of His will for them in particular, in all wisdom and understanding. And that He would fill each and every one with faith, courage and obedience equal to the task. SIxth, to be a channel of God’s voice calling more workers to serve in His white and burgeoning Harvest. It has been my privilege to serve 32 years as a witness of the Lord Jesus Christ, two decades as a missionary, and once as the author of a book. I count it a great honor to have lived amidst Arab Muslims who had never known any Gospel witness, and to show them the God who is. Lastly, I am unspeakably grateful for how God has changed and grown me, my husband, and my children through all of these experiences. Thank You, LORD. May the LORD shepherd you, strengthen you, and be your life. hate, fear, or intolerance? none of the above. The persistent, ongoing effort to push people into camps labeled “Tolerant / Accepting” or “Hateful / Fearful” is alarming. It leaves no room whatsoever for intelligent moral dialogue.This forced polarization is increasingly obvious in every topic across the gamut of human discussion, from homosexual marriage to the public education of children. As the Church, we must not allow ourselves to be sucked into the vortex of these hot-air windstreams and media tornados. We need to keep our wits about us, and to exercise discernment. If we don’t have discernment, we need to pray for it. Although I would not presume to speak of things which are out of my sphere, there is something that I can address with some amount of knowledge, understanding and experience. I am writing as one who has been a follower of Christ for 32 years, and who has spent more than half of those years living among Muslims. My heart’s desire has been to show Muslims how much God cares for them, what lengths He has gone to to save them, and what forgiveness, abundant life and eternal blessing He offers to them through the unbelievably grace-filled sacrifice of His Son, the Lord Jesus Christ. For this reason, I gave up a successful career, said goodbye to my loved ones, gave away most of my worldly goods, and went to sit with the locals in the hot sands of a little Muslim town on the Islamic Arabian Peninsula. I have sat with them, eaten with them, listened to them, and learned from them. We celebrated weddings, births, and small personal triumphs together. We grieved over losses, misfortunes, injustices and deaths. We have shared shock, sadness, surprise and laughter, as we lived a whole range of human experience together. At times, I have clothed those who needed it, fed those who were hungry, drove them to hospitals, bought medicine they couldn’t afford. For years, my family and I were a part of our Muslim community. I do not present these details to boast or impress, because any good we do is only accomplished by God’s Holy Spirit moving us “to want and to do His good pleasure.” Rather, I share these details in order to demonstrate that I am not fearful of Muslims. And that I do not hate Muslims. But that in fact I have a heart for Muslims. And I know whereof I speak. It is therefor possible for me to say two things that are both 100% true: 1) I care deeply about Muslims and desire them to know the True & Living God that so many of them are honestly seeking, and 2) the goal of the religion of Islam is Umma, a world-wide subjection to Islam, of which the nations of the earth should be fully aware and forewarned. The fact that most of our Muslim friends have no interest or involvement in achieving Umma does not negate the fact that the religion of Islam commands it, or that other Muslims will seek its fulfillment. If you are a believer who is feeling pressured by the fictional but unrelenting “only two camps” rhetoric, please consider this alternative view. A view which is by no means new, but appears to have been forgotten in recent times. When a government stands against the spread of something it perceives as a threat to its national life, identity, or populace (eg, Umma), it does not mean that followers of Christ (or any individual) must therefore stand against their neighbors (eg, Muslims.) On the contrary! Let us allow governments to fulfill their God-given role of protecting their citizens while we as the Church, and as individuals or Christian groups, minister to the needs of Muslims wherever and however we can. Let us support Christians, Muslims, and all who are suffering at the hands of radical Islamic terror groups, just as we have served the lost and needy (regardless of cause) for centuries. Within every realm and type of human government, under every kind of regime, God’s people throughout history have found a way to show His love to those around them. And it is no different now. Please pray for the Harvest and the Lord’s harvesters! What about Franklin Graham’s border-closing idea? There seems to be some unnecessary division in the Body of Christ surrounding Franklin Graham’s statement about closing the US borders to Muslim immigration. After reading two articles accusing him of inciting hatred and spreading fear, I decided to actually read Mr. Graham’s Facebook post and to watch his Fox News interview for myself. I wanted to hear his own words and observe the non-verbal communication in order to get a sense of where he was coming from, and to see what everyone was so upset about. I’m glad I did. It seems to me that the argument is one of those “apples and oranges” kind of conversations, where people compare things that aren’t really comparable. The result is an irreconcilable, and completely unnecessary, stalemate. On the border-closing topic, Mr. Graham is talking to Americans about what the US Government should be doing to protect its citizenry from a viable threat by Islamic terrorists. He is speaking as a patriot, and encouraging other citizens to seek that protection through the use of their Constitutional right to appeal to their representatives. In their rebuttals, Mr. Graham’s opponents are talking about how followers of Jesus should be reaching out to Muslims in the love of Christ. They are speaking as those who have dear Muslim friends, and who don’t want all Muslims to be classified and viewed as terrorists. In a nutshell, Mr. Graham’s critics are exhorting the Body of Christ to realize that most Muslims are not part of a terror organization, and that many Muslims are in fact victims of such groups themselves. Their heart is for the Church to show the love of God to Muslim people. People who may in fact be refugees fleeing the terror, and need a place to go. A place like America. It seems very clear to me that both sides of this “argument” have their hearts in the right place, and each one makes perfect sense in its context. Only, it is not the same context. The two sides are not talking about the same thing. What do I mean? It’s about roles. The role of government and the role of the individual are not the same, and for good reason. The fact is, government has the moral responsibility to protect the welfare of its citizens. At the same time, each individual has the responsibility to love his neighbors. It is a difference of roles. Good and evil are everywhere. In every place and in every people group. The fact that we all have many nice Muslim friends that we care about and who care about us does not mean that Islamic terror groups are not really a threat. It does not mean that countries should not take steps to protect their citizens from radical militant Muslims. In fact, Muslim countries are making every effort to do just that! If there is anyone who understands just how dangerous Islamic terror groups really are, it is our Muslim neighbors. We believers have the opportunity to shine brightest when the world around us is darkest. Let us rise to the occasion as individuals, as local bodies, and as The Church. Let us not expect government to do for us (or for others) what only we are commissioned and empowered by our Lord to do. Post-Script: Many Christian individuals and organizations are ministering to Muslims in the midst of the terror. More on that in my next post. The debate itself has perplexed me. When the question was put to Arab Muslims who have come to Christ, they had a similar response. First a puzzled look, and then, “Of course we call The God “The God”. What else would we call Him?” The Arabic word “Allah” is literally “The God”. “Al” is the definite article “the,” and “lah” means “god.” Put together they refer to the Supreme Being, somewhat along the lines of El Senor in Spanish. In the English language, a generic word “god” is given a capital letter to denote the same thing, “God.” When English-speakers see the capital G we all know Whom we are talking about. In Arabic, of course, there are no capital letters, but the Arab way of distinguishing is no less understood to them than ours is to us. Perhaps the whole debate originated with well-meaning theologians who did not have a grasp of the Arabic language, or who perhaps did not consult with native speakers while discussing it among themselves. Arab Christians of every denomination have used the term “Allah” to refer to God for centuries. The actual covenant name of God given to Moses in Exodus 3:15, “I AM THAT I AM”, is by the way literally translated in Arabic Bibles. In any case I would like to speak to the issue, but from another vantage point. If someone stole your identity and went on a spending spree, your creditors would assume (at least at first) that it was you racking up the bills. If the thief managed to hack your Facebook account and email, he could do terrible damage to your reputation and relationships, in short order. Everyone would think he was you. Whatever he did & said would be credited to you because, well, he’s doing and saying it in your name. And herein lies the heart of the matter! If ancient Arabic-speakers called a pagan god “The God” (Allah) it would have been because they believed that god to actually be the Supreme Being. That certainly is true of modern Arabic-speakers and the god of Islam. Muslims do, in fact, believe they worship the God the Universe, the God of Creation, the God of Abraham. It is a case of divine identity theft. Let me explain. The Quran and the Bible each claim to be the revelation of the one true God. In other words, both books testify about the same Divine Person. Through the pages of the written word His nature, personality, motives, ways, purposes, and heart—in short, His divine identity—is clearly demonstrated. However, the Quran paints a completely different portrait of God than the Bible does. What Muslims believe about God is entirely counter to what the Bible teaches about Him. When a Muslim is born again, he meets the one true God for himself. Any discrepancies about His true character and identity will be, of course, cleared up by Him directly. Actually, now that I think of it, that’s what happened to me when I met the Lord. He wasn’t at all like the deity portrayed by the church I grew up in. Let us rejoice with the multitude of Muslim-background believers who now know and worship The God in spirit and in truth! “Would you like to see photos of my family?” the middle-aged gentleman asked me. Although I had just met him a few minutes ago, the question seemed ordinary enough. Everyone seems to carry some device with a camera in it these days, after all. “Yes, I would like that,” I replied. I didn’t have to wonder why he felt that way. Being in the depths of his grief and loss, any connection to the people who had caused it was unthinkable to him. Still, I did wonder if he had ever made the same statement about Islamic terror groups that kidnapped African school children, or burned Christian villages in Pakistan. Was it simply because this group was killing his own people, Middle Eastern Muslims, that they were therefore “not Muslim”? Of course I could not ask him such a question immediately, out of respect for his suffering. So I continued to sit with him, silently. “They are not Muslims!” He repeated it over and over, with such earnest that it seemed he was trying to convince himself, rather than me, that it was so. My heart went out to him. Is it so? Are IS or any of the other self-proclaimed Islamic terror groups really “not Muslim”? How do we judge? The most obvious means would be to use the Islamic measuring stick. What makes a person Muslim, according to Muslims? How many of these terror groups are claiming to be “Jews, Christians, or Polytheists”? Indeed, they themselves are claiming to be Muslim. So they have birth, and their own confession of Islam, on their side of the argument. What if their parents did raise them as something else? Then what? According to most any Islamic authority, to convert to Islam out of another religion, one must recite the shihada, which states “There is no god but Allah, and Muhammad is the messenger of Allah.” Many a dear Muslim friend has urged us to “Just say it!” This is because once a person recites the shihada he or she becomes Muslim, a member of the only religion given by Allah. Being in the true religion is what changes a person from “infidel” to “Muslim.” Whatever they do with their religion after that is up to them. The shihada is the doorway into the religion of Islam. Once inside, they might be a good Muslim or a bad Muslim, but at least they are in. It might be argued by some that a Muslim must perform all five pillars of Islam to be a “real Muslim.” That would mean not only saying the shihada (statement of witness), but also doing salaat (ritual prayers), sawm (fasting), zakat (specified alms), and hajj (pilgrimage to Mecca). But the fact remains that even the most unobservant Muslims– the ones who don’t pray, don’t fast, or who even live secular lifestyles- are still considered Muslim by their peers. Whether you are born into a Muslim family, or converted through saying the shihada, the point is the same. Your peers might judge how well or how poorly you keep up with your religious duties, but they don’t question “if” you are Muslim. Of course I have no information on whether the members of IS are keeping up with their religious duties, but I do know that they confess the shihada. Often. The first line of it is written on their flag. By this most singular Islamic standard, they are Muslim. Good or bad, they are in. Does that mean every member of the group genuinely has the spread of Islam as their motivation for killing and plundering? Probably not. To those who contend that IS jihadists are not Muslim, I can only ask, “By what standard are you measuring?” If IS members were originally born Muslim, claim to still be Muslim, and affirm the Muslim shihada, they already meet the criteria by which most Muslims judge themselves and each other. The fact that they are engaged in jihad, the sixth pillar of Islam, means that they more than meet the criteria. This, in effect, means that IS militants might well be considered even more Muslim than their Muslim critics who are not participating in jihad. And sadly, it is exactly this line of reasoning that “justifies” (to themselves) their extermination of others within the religion of Islam— specifically, Muslims who, in their view, are not doing the full will of Allah. There are at least 80 Islamic terror groups that I am aware of, and I am not known for being a particularly savvy person when it comes to world events. There must be something in the pages of the Quran, Hadith, and related Islamic teachings which leads people to believe what these militants believe. Yet I also know many Muslims who, like my grieving gentleman friend, are appalled at these groups. They are Muslims who sincerely believe theirs is a religion of peace. Nabeel Qureshi has done an excellent job of explaining exactly how a Muslim could think that (in case you were wondering) in his book “Seeking Allah, Finding Jesus.” My hope is that it will be translated into Arabic so that many more seekers of Allah will find Jesus, as he did. In the meantime, we hear many reports from fellow Christian workers of Muslims coming to Christ through the terror crisis. Some who fled IS were sheltered in refugee camps where they heard the Gospel, and became believers. As one family said, “We lost everything, but it was worth it. Because of that we have now found Jesus!” Christians in war torn areas have experienced the miraculous provision of God, enabling them to care for others, including Muslims. Many have come to Christ through the ministry of compassion. When I was a kid, my mom and dad gave gifts to everybody. Not just the family, relatives, and personal friends. Everybody. A couple of whole days were carved out of our family’s busy holiday season and devoted to the production of umpteen quadruple-batches of Christmas goodies. After the baking was accomplished and the kitchen was cleaned up, scads of decorative paper plates were laid out to be filled with homemade goodness. Gift plates covered the kitchen table & counters, the dining room table and sideboard, and even the top of the laundry room washer & dryer. Once loaded with the appropriate assortment, each plate was put into a plastic bag and adorned with a shiny red or green bow, perhaps a candy cane or two, and a label. The delivery of all these gifts took some time. Quite a number were brought to my parents’ workplaces and distributed all at once,to bosses and co-workers, department heads and cleaning personnel. Other plates had to be given one at a time. When we brought one to Old Mrs. Kretzler, the widow who lived about a quarter-mile down our country road, there needed to be a good hour of visiting and listening that went with it. Plates for our Italian relatives (and almost-relatives) in New York were delivered on Sunday, when we made our weekly trip into the city to visit Grandma & Grandpa in the Bronx. Mom and Dad gave their gifts of holiday cheer to neighbors, shut-ins, people they did business with, our family doctor, the parish priest– they even left plates in the mailbox for the mailman & the paper boy. My parents’ genuine delight in the planning, making, and giving of gifts has had a life-long impact on each of their children, and their children’s families. Their gifts were given freely, without thought for receiving in return. The boss & the paperboy were treated alike. There was thought & care in the giving process, as in the example of Mrs. Kretzler. So many good life lessons were contained in that one family tradition. Although my own family doesn’t bake plates of goodies, we do give gifts. Each year Mike & I have involved our children in giving gifts to our Muslim friends, neighbors, and acquaintances, which we hope will help them come to know the Christ of Christmas. I don’t know the context in which you live, dear Reader, but I’d venture a guess that you will be doing some gift-giving of your own. If you are wondering what to give, may I suggest the gift of inspiration that comes through truly good books. Some of the greatest thoughts to impact my life have been discovered by simply reading a book. I came to know the Lord through reading, and my faith since has been immensely empowered by missionary biographies and other amazing God stories. Chances are, you can attest to the power of wisdom that has been passed-on through books in your own life, as well. 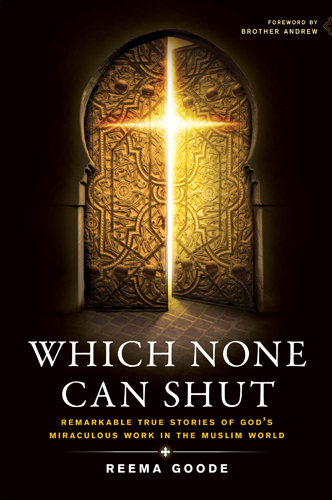 Of course I recommend Which None Can Shut as an encouraging piece of literature that exalts the One who is the reason for the season, but there are literally thousands of powerful testimonies available in book or audio book form. Why not consider the gift of inspiration for your parents, children or grandchildren, or for the young people you know in highschool or college, or for your church’s Youth Group. For your pastor, elders, choir, Missions Committee members, or Sunday School (teachers and students alike). Books can also be ordered in different languages to use as an outreach– Which None Can Shut is available in Spanish, Portuguese, Polish, Russian, German, Norwegian, and Chinese in additioin to English. Whatever you do with your gift list this year, my family and I wish you a bright and blessed, happy & holy holiday. When we brought Lydia back to the USA to begin college life as a freshman at university, our entire family hit a steep learning curve. Lydia was our first child in college, and Lydia’s parents were way too old to remember anything about how the process is supposed to work. We even had trouble deciphering the modern dot-edu vocabulary people were using to explain it. By the grace of God, all eventually got accomplished and we drove away from our baby, committing her into the hands of her loving Heavenly Father. Lydia had been trying to be careful with the money Mom & Dad had given her. Still, when she became aware of a financial need that a certain other student had, she felt in her heart that she should do something to help meet it. After giving the money, the peace & joy in her heart confirmed to her that she’d done the right thing. A couple weeks later, Lydia’s own wallet was empty. Good thing she was on a meal plan, but for everything else she’d have to wait until her pay came in. Lydia had been under 18 when she began working at her on-campus job, so she hadn’t had a bank account that her paycheck could be deposited to. Her pay was supposed to be electronically deposited to her parent’s bank account in another state, and then mailed from her parents to Lydia by personal check, until something else could be arranged. That would take forever! It was at this point that some friends decided to go skating, and invited Lydia. As Lydia was walking & talking to God, she happened to glance down at the sidewalk and stopped in her tracks. There, lying on the sidewalk directly in front of her, was a five dollar bill. She picked it up & looked around to see if there was anyone nearby who might have dropped it. There wasn’t. Rejoicing, praising, and tickled by God’s playful sense of humor, Lydia scrambled her gear together & headed for the skating party. How can we ever thank God for all He has done for us, in giving us children, in bringing them to Himself, and now in taking them each in their own directions with Him. I am speechless and teary-eyed just thinking about the significance of this testimony. Because it was not only for Lydia’s heart that He answered her in this way; it was for her parents’ hearts as well.